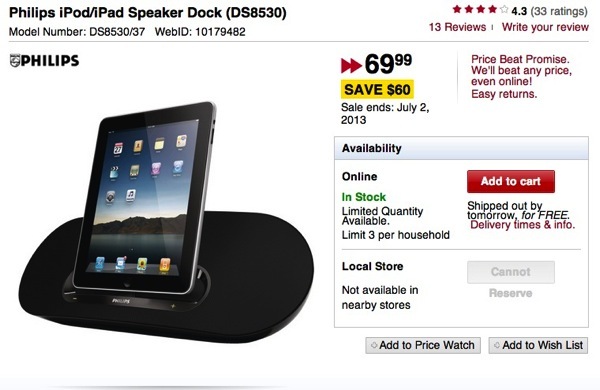 If you’re looking for a 30-pin speaker dock for your iPhone, iPad or iPod, the Philips Fidelio is currently on sale at Future Shop for $60 off, at $69.99, part of an online-only Canada Day sale. This same dock retails for $169.89 from Amazon.com and $276.99 from Amazon.ca, so this $69.99 sale price is decent. Reviews for this unit are above average so do your research and make a quick decision. The sale ends July 2, 2013. Let us know if you’re going to jump on this.